I’ve seen quite a few questions online concerning beginning training in the world’s favorite lizard-shoes, the Vibram Five Fingers. As a proud owner of said shoes and writer of a running blog, I feel compelled to address this issue. As a disclaimer, though, I use them mainly for track sessions, rarely doing more than 3 miles with them. So if you’re interested in doing long runs in your Vibrams, I can’t give you any specific advice, though what I say may still be relevant. First of all, and most importantly, take it slowly at first! Yes, I’m sure you’re excited to have the coolest shoes in town, but if you start out with a 15-miler, I assure you that your calves will hate you for a long time. I started with just one short run a week with them, even shorter than my typical short runs. If you still want to get in the distance, switching shoes midway is always an option (though I’d recommend starting with the Five Fingers, because getting them onto sweaty feet mid-run might be a challenge). Secondly, unless you’re used to barefoot running/walking, expect some pain. My calves especially suffered, though nothing too terrible. I’ve seen recommendations to begin by walking in them for a while before running. It’s sound advice, though you can expect some stares if you plan on wearing them to work (they’re just jealous). Thirdly, I do not recommend racing in them, at least at first. I raced the Fifth Avenue Mile in them last year, and it was not a smart decision. Racing the mile alone would have been fine- but I didn’t take into account all the walking around and warming up I do before races, which puts considerable extra stress on unprotected feet. (On a related note- the city has a lot of rocks! One of the many things you discover when your soles are less than a centimeter thick). So take into account all the pre-race walking around before showing your Vibrams off to the competition. If you do plan on racing in them soon after you get them, I recommend getting to the race in different shoes and putting the Vibrams on there. But give yourself enough time, you don’t want to get caught struggling with them when the horn blows! As per running form in the Vibrams, I can only tell you what I do, which is pretty much a sprinting pose, landing and pushing off with the front of my foot. But I mainly wear them for speedwork, so if you’re doing longer, slower runs in them, or you’re typically a heel-striker (I land mid-foot in normal shoes), then it might be better to try something closer to your normal stride. Or simply do whatever is most comfortable. But don’t take my word on this issue, there may be better advice out there. No, this is not a post about my first mile. It is a race about my first mile race. Yeas, I probably should have clarified that in the title, but it’s too late now. No, you’re right, it’s not too late, but I refuse to change it. Especially now that I’ve begun the post talking about the title; changing the title would now require reqwriting everything I’ve written so far. Anyway, enough about the title. This is about my first mile race, after all. It was September 26. The 5th Avenue Mile. I was full of nervous excitement for my shortest race ever, and worried that my tendency to start out too fast would seriously hurt my chances in the mile. And boy, did it ever. My much faster brother was racing as well, and I knew when I saw him at the 1/4 mile mark that I had gone out too fast. It wasn’t until later that I found out that my brother had gone out too fast also- meaning out I had gone out WAY too fast. But there was nothing I could do about it at that point but keep running. and B) who sprints to the finish halfway through a race? Another weird thing that happened was that during the last 1/4 mile or so, my arms felt like they were physically weighted down. I’m not the only person to experience this, I hear, but it was a first for me. The mile does strange things to the body. I forgot to mention that this was my first race in my Vibram Five Fingers! To be honest, I was disappointed. 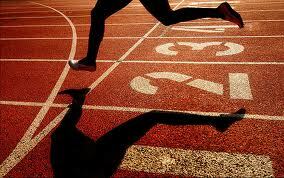 When I did speedwork in the Five Fingers I always ran on my toes, in a sprinting position. It was comfortable for short distances, and gave me better turnover. But then at the race, about halfway through, I had to go off my toes and start landing normally (on the heel and mid-foot). It could be my muscles just weren’t prepared for keeping that stance for so long, or it could also be that it was the wrong way to race in the first place. Well, that about sums up my first mile race. I couldn’t have gone into more detail than I did because it all seemed like a blur to me. For longer races, I can break it down by mile, but I have to get used to breaking a race down into less. Oh, and I nearly forgot! I PR’ed! Granted, it was automatic considering it was my first race, but I beat my non-race PR by 9 seconds, so it counts for something. 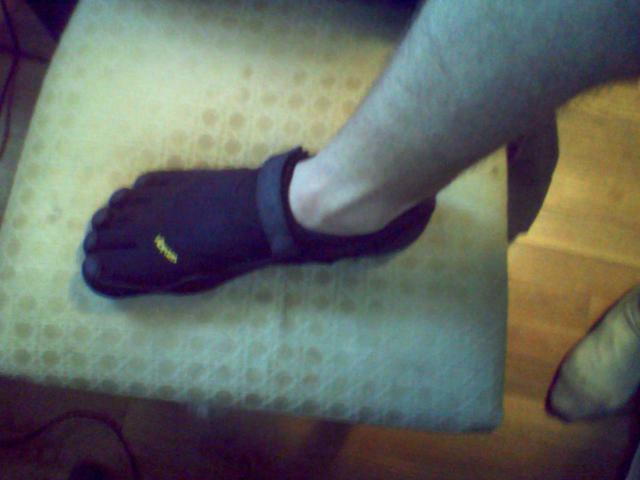 My Very Own Pair of the Vibram Five Fingers! Oh Boy! I got them! The most ridiculous-looking running shoes ever invented are now mine! It may seem strange that I’m so ecstatic about receiving something that will make me a laughingstock of the running (and non-running) community. And normally, I would not be happy at all in such a case. But this is special. This is the Vibram Five Fingers. The 'glove shoe,' in all its glory. As an aside, you may notice that my tan line has not yet adjusted to the Five Fingers yet. Apparently, barefoot running has some physiological benefits. The running motion padded running shoes forces us to use is not as natural as a barefoot stride. Vibram Five Fingers take running back to the basics. Of course, that’s not why I wanted them. I wanted them because they looked awesome. They say to work yourself slowly into these shoes, especially if you have flat feet, like I do. So I did a very short, easy run my first time out on them. Then I decided to be stupid and ignore all the sensible advice given to me, and ran 3.5 miles at a decent clip my next time on them. Let me say one thing: they were not kidding about working into these shoes. My calves are shot. But, of course, that won’t stop me from doing it again. It’s a very different type of running in the Vibram Five Fingers; it turns my regular stride into more of a sprinting stride. Also, the way I have to watch every step carefully lest I land on some glass reminds me of trail running, were a wrong step may careen me off the side of a mountain (I may be exaggerating a tad). And anything that reminds me of trail running is awesome in my book. I’ve only had two runs on the Five Fingers, so I can’t give a full review of them yet. My calves may hurt, but that’s not a fault of the shoes; it’s my own stupidity that is at fault there. But forgetting the pain for a moment, I know already that I’m going to love them. I’ve been thinking recently about buying a pair of those crazy-looking, insult-inviting, glove-shoes also know as the Vibram Five Fingers. Based on the idea that running barefoot is the most natural, efficient, and healthy way to run, the Five Fingers essentially provides the benefits of barefoot running along with some of the protection that the typical running shoe provides. I’ve heard that they’re not great for long runs but are pretty cool for short to mid-distance runs. I’ve been meaning to buy lighter shoes than the Asics I currently wear, and I was going to get a nice pair of Brooks when I remembered this new fad. The Five Fingers are about the price (or less) of a decent pair of running shoes, so I’d like to know that I’m actually able to wear them consistently before I invest in them. I’ve also heard that sprinting barefoot is considered pretty healthy, so I would imagine that these would be great for sprinting. At the moments, the Asics I wear are terrible for sprinting; they’re heavy and make it impossible to run on my toes. With these, I’d have no problem running on my toes. In fact, the biggest problem I’d have with these would probably be not running on my toes for the longer runs. In the meantime, I will continue to research these shoes more. I tried to link a review of them to this site, but it contained spam and shut down my whole blog, so I will allow anyone interested to look more into it on their own (Runner’s World has a nice review). I have yet to decide which shoes will next adorn my feet: Brooks or Five Fingers. I think I’ll probably end up going for the Brooks, since I can wear those for long-distance runs and races without worry. But one day I’d like to own a pair of Five Fingers and become known as my town’s ‘lizard man,’ which will undoubtedly happen according to accounts of new Five Fingers owners. But if it makes me run faster and better, I’m all for it. Running, as we all know comes with sacrifices. And dignity is often the first thing to go (the first day I wore those new running shorts comes to mind…). So inviting some new reasons to mock my running habit doesn’t worry me in the slightest.